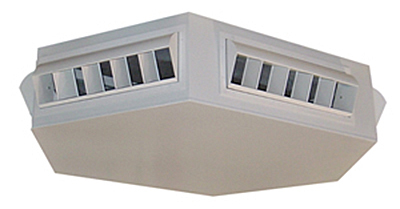 Spinnaker’s supply air diffuser heads are available in various styles with sizes ranging from 5 to 30 tons in 4 or 6 sided configurations Features include adjustable drum louvers or double deflection adjustable grilles on all sides, heavy gauge steel cabinet with internal insulation, air deflector, corner hanging brackets, top supply duct connection flange . Exposed portion of the diffuser is provide with a white enamel paint finish . These assemblies offer adjustability of air pattern, quiet operation and a substantial savings over the cost of a conventional duct system. Optional construction of stainless steel and aluminum provide superior corrosion resistance in difficult environmental conditions. Custom colors are available.